I’m doing an end-of-summer wardrobe clean out–see tops here and how to fight the fear here. Today, dresses! Continue on for cuts and keepers. Dress from Walmart my mama bought me. Mom, I love you, but this dress does not love me back. I dig more structured pieces (see the keepers below), so I hardly ever reach for a dress when I want to be comfy on the weekends because I like to sit, play with my kid, do handstands…and when I do reach for a casual dress, it’s now the J. Crew dress with a dropwaist silhouette that makes me feel less food-baby (thanks, pleats) and more FUN, baby. 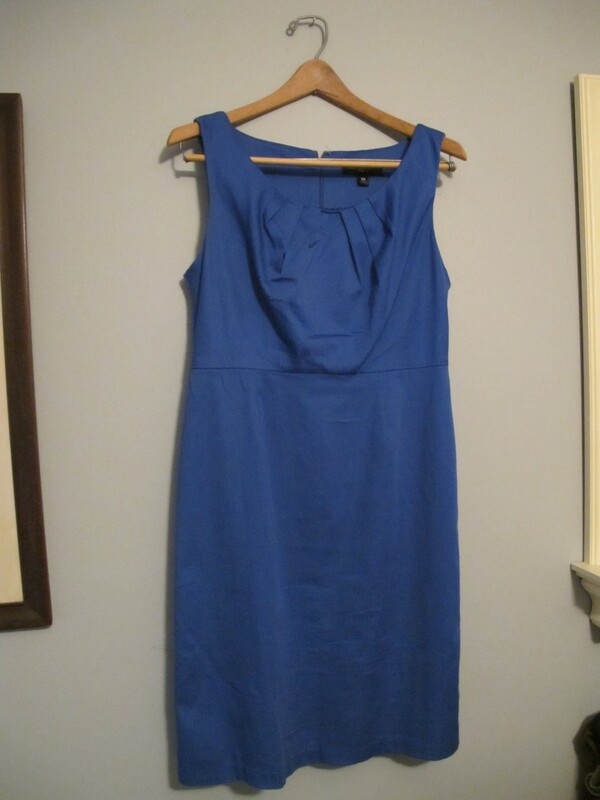 Ann Taylor blue sheath. This dress is a great color and a great silhouette but the pleated nonsense at the neckline doesn’t know how to behave–it makes me feel poufy in a weird spot. Should’ve listened to my style conscience when it told me this “interesting detail” would prove, well, too interesting for my taste. Even though someone who never gives me clothing compliments dug this. And I looked nice while preaching in it. And it’s Ann Taylor. SO WHAT I DON’T LIKE IT. Adrienne Vittadini navy sheath. Oh how I wish this dress worked… It is my dream navy sheath: perfect cut, great fabric, and a classy waist detail to create some visual interest. But friends, I succumbed to thrift lust and bought it even though it is a size too big–because dresses are a little more forgiving than, say, pants, the perfect dress in just one size too large/small is one of the harder things to say no to in thriftland. But I just can’t ignore the loosey-goosyness anymore. Or the seam that is starting to come apart…. goodbye, navy sheath, may I meet your next incarnation under better circumstances! 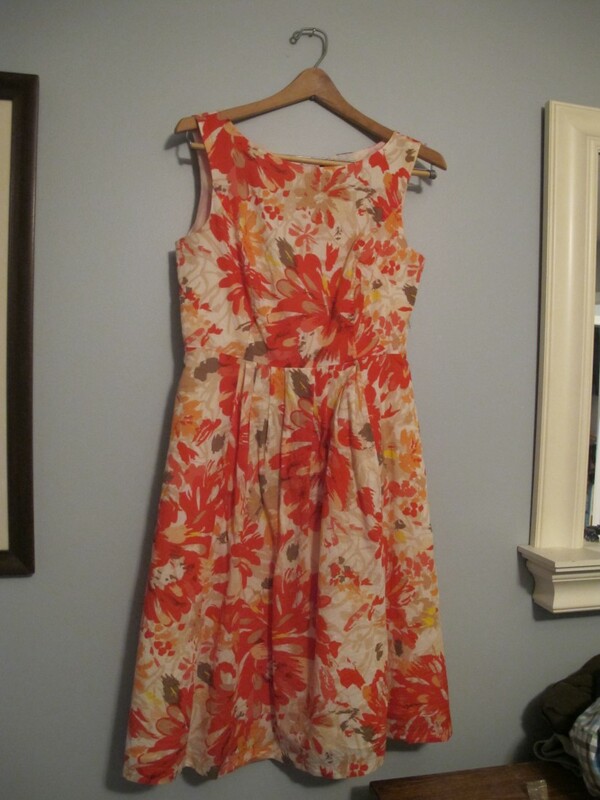 Signature by Robbie Bee floral party dress. I love the colors in this, and it’s lots of fun to wear–but it feels like a PARTY and I don’t go to warm weather, outdoor parties very often. In fact, the last time I wore it was for Easter with a wide red belt I’m keeping specifically to go with this dress (hello, wardrobe exponent). So I’ll stick with my sheaths and pass this on to someone who’ll love it more. 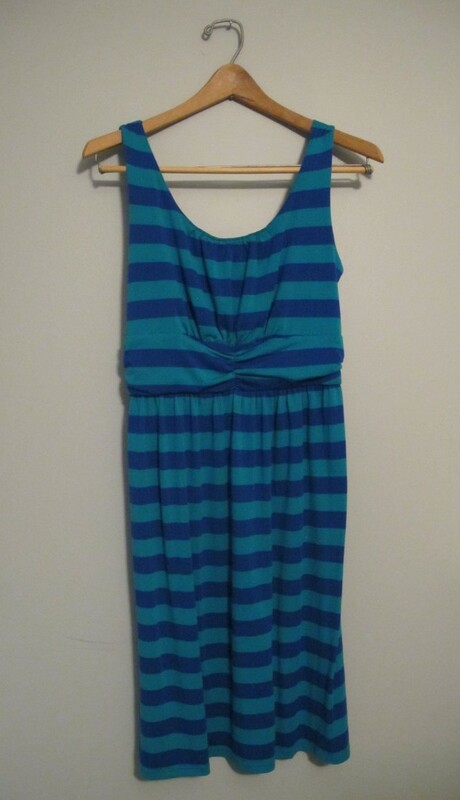 Loft light teal dress with pockets. I like the color of this dress. I LOVE its pockets. I do not love, or like, how short it is–too short for me to feel comfortable at work or on the floor without leggings, and it’s too hot here to wear leggings from May pretty much through September. And then it’s too cold to wear a sleeveless dress! Plus the arm holes are too small and cut into my armpits. Buh-bye. The colors and the fun personality have had me wearing this one for years–not on heavy rotation because it’s kinda funky but definitely brings it when I do bust it out. Leopard knit sheath with POCKETS. Always sophisticated, works for funerals too. This dress. Just. Does. It. Probably won’t be a forever but I’m enjoying the sunshiney colors for now! …BAM. I brought my own flowers to the #awkwardbathroomselfie today. Check out the blog (link in profile) for more on how to style this number for a wedding. And don’t be afraid to workout at work–dresses make it easy to do your own #Superwoman super quick change!